Why should guitarists have all the glory? Guitar effects can be used for synth sounds too. This is intended to be more of a sound experiment -- almost like a demo -- than a composed piece, but the music is very enjoyable nonetheless! Virtually all sounds were processed through one or more stereo sets of analog effects pedals as shown in the cover art, giving the piece a very vintage, throwback, unreal quality. In particular, the piano processed through analog chorus and real analog bucket brigade delay is to die for! 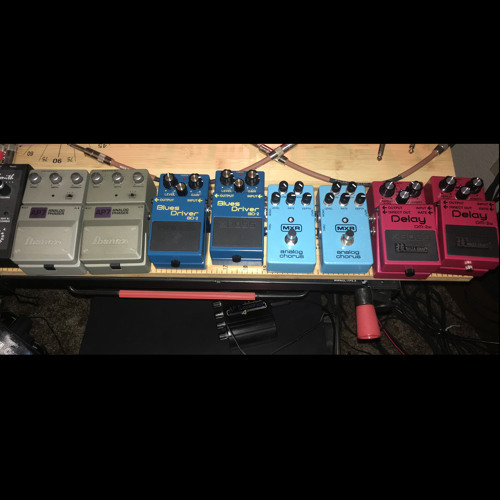 Effects pedals used: -Ibanez AP7 phaser (no longer in production -- SO GLAD I got these when they were still made!) -BOSS BD-2 Blues Driver -MXR Analog Chorus -BOSS DM-2W delay (the best of the pack) In case you're curious, the reason there are two of each type of pedal is to allow for stereo processing. This gives such a massive sound probably not heard anywhere else. Enjoy! heh you do know that soundcloud drops all quality to mp3 128kbps at 44.1 sample rate and 16 bit ? I'd like to hear this with better resolution actually. Maybe upload to youtube ?